More than 300 years ago Newton predicted the year the world would end. We at 2060 dare to officially start the Countdown and remind the world that life is meant to live it to it's Fullest. 2060 is no ordinary hostel. 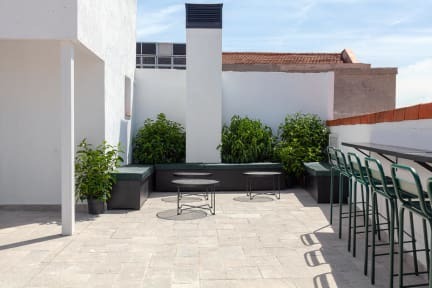 It is a new accommodation concept which will tingle all your senses, relax you and allow you to experience the alternative in the very heart of Madrid. 2060 Newton Hostel has a privileged location in Tirso de Molina Plaza. A perfect starting point to visit and explore Madrid from the very center and surrounded with the local's favourite neighborhoods. In addition, near to our facilities other important landmarks of Madrid are 'around the corner' such as El Parque del Retiro, el Templo de Debod, el Palacio Real de Madrid or el Museo del Ferrocaril de Madrid. The rooms are on different floors, the more you go up and better is the view. The rooms are furnished with bunk beds or single beds, all in a modern and minimalist style. Furthermore, we have several common areas where the guests and travellers will be able to get together and exchange past experiences and future plans. Likewise, all these services are included within our facilities: air Conditioning in all the building and rooms; lockers with your own padlock or borrow one; dining room; fully equipped kitchen; high speed internet and Wifi; laundry facilities; 24 hours reception; luggage storage; rooftop bar; computers; and lounge with TV. Late check out (extra charge) 14:00.
very good location and nice staff, highly recommended! Excellent staffs and Excellent location ! 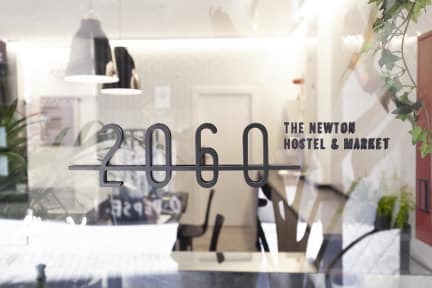 極好的員工及極好的位置！I fully recommend the 2060 Newton Hostel of Madrid.